FREDERIC COWEN (1852-1935): Symphony No. 5 in F Minor, PERCY SHERWOOD (1866-1939): Concerto for Violin, Cello and Orchestra. Description: At a time when his Third Symphony, the “Scandinvian” was still very popular in Britain, Cowen’s Fifth, finished in 1887, proved to be much more ambitious and highly developed. In four movements and 41 minutes in length, it’s one of the biggest English symphonies before Elgar. Like the Beethoven Ninth, its slow introduction to the first movement contains themes which appear throughout the late movements and which are developed contrapuntally before the main Allegro begins. A weighty seriousness, at moderate tempi, pervades all but the second movement, an Allegretto of “Faery music” which is not so much Mendelssohnian as it is “British Light Music” - a genre Cowen was also well-known for. A particular intensity of feeling marks the slow movement while the finale, starting with a dark theme in F minor, works its way to a feeling of difficulties overcome in relative triumph. Lovers of “Sounds like Brahms” composers will find much to admire in German-bred and -domiciled Sherwood’s 1908 double concerto (at 36 minutes, also a large-scale work) which has the same scoring and choice of tempi and keys as Brahms’ Double Concerto of 1887 (Sherwood will certainly have heard it during his student years in Dresden) but his own personal stamp is audible in its very different harmonies and textures and a softer and more lyrical personality. 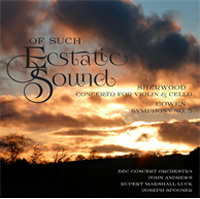 Rupert Marshall-Luck (violin), Joseph Spooner (cello), BBC Concert Orchestra; John Andrews.